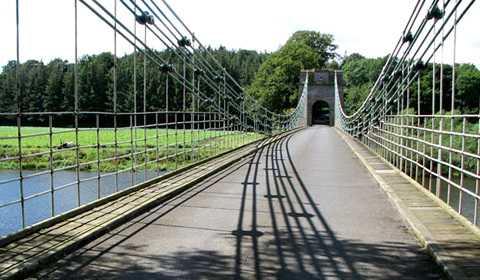 Wales played a significant role in the development of the suspension bridge in the first half of the 19th century. It is home to two outstanding examples of the period — Thomas Telford's Menai Suspension Bridge and Conwy Suspension Bridge. It is also home to the much-rebuilt but pioneering Llantysilio Chain Bridge, and some of the prolific output of Captain Sir Samuel Brown, whose Union Bridge used Welsh iron and was the first road suspension bridge in Britain. The huge industrial complexes in the valleys of South Wales were producing iron in unprecedented quantities, and British engineers were exploring ways to use it to construct bridges of ever-greater span. Chains of iron were ideal for supporting 'modern' suspension bridges, which featured horizontal decks designed for road traffic. Captain Brown's Newbridge chainworks (Brown Lenox) at Pontypridd in South Wales was in the forefront of this development. This adaptation of Stephen K. Jones' essay focuses on the work of the two engineers who dominated chain bridge constructed in Britain in this period. Captain Sir Samuel Brown (1776-1852) was responsible for a large number of suspension bridges (built and proposed), of which three important examples survive. Thomas Telford (1757-1834) knew Brown and shared his confidence in suspensions bridges. Stephen K. Jones's research is focused on the Newbridge chainworks and on Brown's papers held in the National Archives of Scotland. His research for the touring exhibition sponsored by ICE Wales Cymru — Web of Iron — has resulted in two permanent exhibitions. One is at the Chain Bridge Honey Farm Visitor Centre, Horncliffe, near Berwick upon Tweed. The other is at the Thomas Telford Centre, Prince's Pier, Menai Bridge, Isle of Anglesey. "In 1814, I erected a bridge with the road or platform perfectly horizontal ... at Mill-Wall ... It was inspected by the late Mr Rennie and Mr Telford, who drove their carriages over it; and it has been considered ... a remarkable combination of strength and lightness ..."
Pictured is the UK's first wrought iron cable chain suspension bridge, Union Bridge (1820), now the world's oldest surviving bridge of its type.